TMC Heart's Japan tomorrow night! The tragic earthquake and tsunami in Japan rocked a nation. I guess I'm fortunate to say that I don't have many friends or family in Japan. And luckily, my friend Ebun Omani is safe and healthy. However, that doesn't make me any less affected by the tragic circumstances. Here's to hoping all the best to Japan and the Japanese people and may they get a plentiful amount of help and support! Within our own Austin's Hip-Hop Community, we have a couple artists with ties to Japan, DJ Tako and Tats, who both have family in Japan. Here's to their safety and well being. 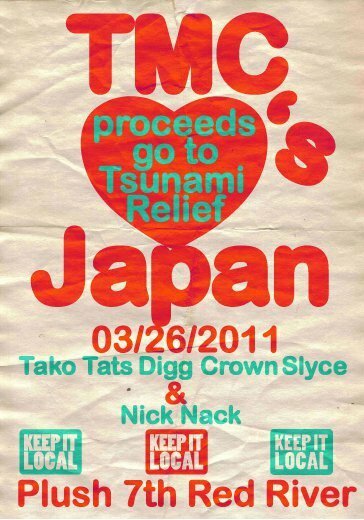 So tomorrow night at Plush, they're throwing a Japan benefit show where all proceeds go to the Tsunami Relief and helps the Japanese people affected. On hand will be some great Austin DJ's Tako, Tats, Digg, Crown, Kid Slyce, and Nick Nack. Please support in your own way and let's show Japan that the Austin Hip-Hop Community Cares! Let us know what you think! Peace! SXSW is now in full effect and SXSW Music is about to run a muck in this place we call Austin! Matt Sonzala, at Austin Surreal, the man behind SXSW Hip Hop has put up the official list of SXSW Hip Hop Showcases. All info is subject to change. Dkutz, The Warriors ATX, Gospel Gangstaz, J.R., Pro, Thi'sl, CY, Tre 9, Cheno Lyfe, Tedashii and more! Just wanted to give an update on what's been going on. We recently added Facebook authentication to the site because we were seeing some unwanted data manipulation. We tried recovering as much data as we could. Apologies to those who have added to the site and saw their postings corrupted with gibberish. The good news is that for the last several weeks since putting in place the authentication system, we haven't seen any unwanted changes in the postings. Unfortunately, the experiment to have a completely open system where people can add Austin Hip-Hop Knowledge didn't go as planned, but needed a little adjustment. So now just log in with your Facebook account and you can post to the site and gets posted to your Facebook wall. Isn't that cool! Is everyone ready for SXSW?! We'll be rolling out some new features to the site for SXSW so stay tuned!